If you want to find out more about PAT testing or compliance with safety regulations then contact us for more information and a free quotation. Alternatively, you can request a call back and we will call you. 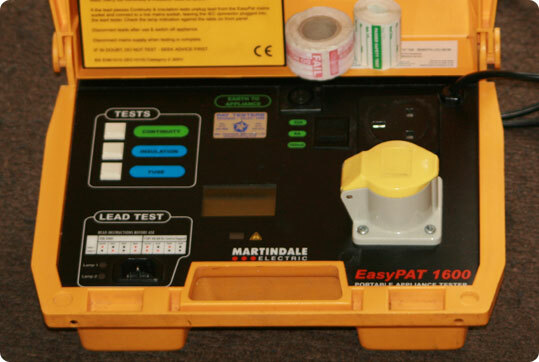 PAT or Portable Appliance testing is necessary for compliance to safety regulations for landlords, public places, offices and workplaces etc. All our PAT tests include a same day service, and are competitively priced; we have a fixed rate charge for up to 10 electrical appliances which is suitable for most domestic properties. We also have a special rate for customers that require over 50 appliances PAT tested, and a “super special” rate for customers that require over 200 appliances PAT tested. All our staff are fully qualified electrical engineers with the latest qualification. Every appliance PAT tested is labelled with a pass or fail, dated sticker and a full schedule of items tested is issued with each invoice (this can also be emailed if required urgently).